Find the right tour for you through Rotorua. We've got 252 tours going to Rotorua, starting from just 3 days in length, and the longest tour is 34 days. The most popular month to go is November, which has the most number of tour departures. "My trip to New Zealand will forever go down as one of the best vacations of my entire..."
"Overall was good but there were quite signifficant waiting time in between activities"
"I was recommended Haka Tours by a good friend who I was visiting in NZ and I booked..."
"Very good guides! Accomodation better than expected. Loved the food that was included...."
"I recently travelled on the new Beach Hopper pass with Stray. We started in Rotorua..."
"Good in arrangement Time allowances for travelling is good"
"The tour is a once in a life time opportunity, packed with plenty of amazing activities...."
"I had an amazing time on the 16 day Amplified NZ Tour and I would definitely recommend..."
"I couldn't have asked for a better tour! It was fun, exciting, well organised and..."
"Amazing! Would definitely recommend! chris and ben were the best tour guides. Skydiving,..."
"Good balance to tour and guides/ drivers were excellent." "Simply magnificent, well organised and first class service 10/10"
"Thank you Robbie and Wild Kiwi for an epic 7-days in the North Island! 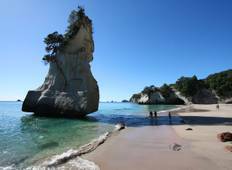 Highlights..."
"We went on a seven day tour of the North Island of New Zealand. My husband and I..."
"Well planned by Topdeck and I met the a lot of people of whom most have become close..."
"I travelled with Stray NZ on their new Beach Hopper Pass. What a great way to see..."